enough oil to keep it burning for one day. The menorah is a special candelabra lit during Hanukkah. Each night of the holiday, the center candle (altar light) is lit and it is used to light the candles to the left and right of it, starting from the left. The first candle is lit on the first night of Hanukkah, two candles on the second, three on the third, and so on. 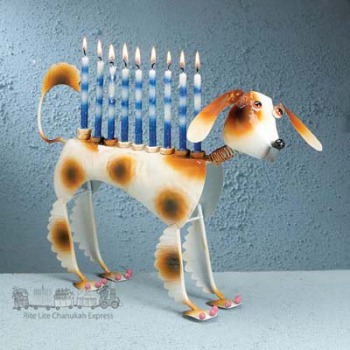 The dog and cat menorahs here are very creative and artistic, and definitely not traditional! Hand-painted, beautifully handmade metal-worked menorah, available from Amazon.com. Aww. 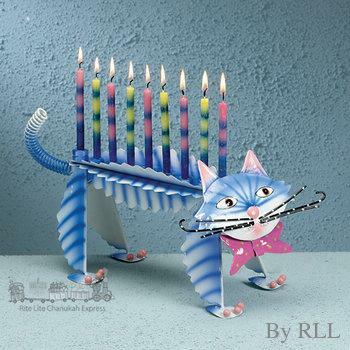 Like Ketzel the Cat, above, Muttle the Dog is delicately metal-worked and hand-painted and makes a beautiful Hanukkah gift for the Jewish dog lover! What a splendid work from artists Don Gidley and Sue Parke! Look at that cat face! 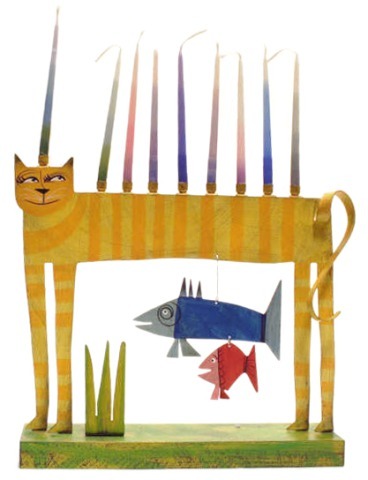 The metal work on the Cat Fish Menorah has a unique distressed finish and is hand-painted. 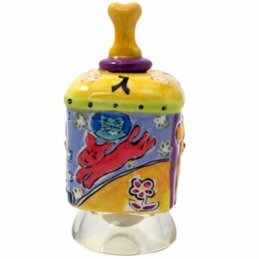 The wooden base is also hand painted. These adorable ceramic dogs are spread out in mirror images from the center, and their metal candle holders look like crowns. At Amazon.com.